Dorner recently completed a 6-month long distributor sales contest. 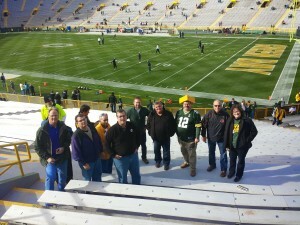 The individual channel members with the highest level of sales between February 1st and July 31st of this year were rewarded with a trip to Wisconsin to see the Green Bay Packers play the Carolina Panthers at Lambeau Field on Oct 19th. We had a great time at the game, including a nice Packers victory and an amazing halftime performance by the Wisconsin Badgers Marching Band! We are honored to have such a dedicated and professional group of channel members. Thank you to all of the distributors that participated in the competition.